It seems that no matter where you go to find the best dogs for duck and water fowl hunting you see a few of the same breeds. For those who are familiar with dogs in general, and with hunting dogs in particular, this comes as no surprise. Certain dog breeds have actually been developed through the centuries for precisely this type of activity. Even so, some veterans of water-fowl hunting with top breeds have tried to answer the question, “Why are some breeds better for this type of hunting than others?” They’ve tried to determine when the top duck dogs were first used and to determine how this happened. There are a few theories about breed evolution, but no one has been able to answer the questions precisely. For many of the very early hunters using dogs to retrieve, the process was little more than mixing breeds while trying to match certain traits to benefit the hunter. Physical characteristics were extremely important, of course. Specific traits become obvious as you look more closely at individual breeds, with each having strengths, weaknesses and enthusiastic supporters. Origins of the top dog on most lists, the retriever, have been obscured by time. Some of the age-old breeds other than retrievers no longer exist, though there are records to show they were used centuries ago. The dogs of today, such as the various retrievers, spaniels and setters, were extremely popular among hunters and outdoorsmen of yesteryear. Poodles are no primarily a decorative breed, but this dog was once known as a solid hunting companion. The Labrador Retriever is at the top of almost everyone’s list of best hunting dogs. In fact, this breed is one of the most popular dog breeds in the world, staying in the number one position for several decades. It’s easy to explain this popularity. The “Lab” is a friendly, loving, easy-going animal, making it perfect for almost every situation, including family pet. This retriever is also extremely intelligent, as well as a quick learner. These traits lead owners to rave about the ability of the “Lab” to find downed birds. As for the physical traits of all good water dogs mentioned earlier, the Labrador Retriever is a physically strong breed, and a very good swimmer. In fact, this is a dog that actually enjoys time in the water. In addition, physical strength and a great drive to work in and around the water, made this retriever a great work-mate, retrieving nets, ropes and floats for fishermen. In some cases, they were prized for bringing in fish, because they have a remarkably “soft” mouth. History shows the “Lab” originated in the Canadian area of Newfoundland. The breed was recognized by the American Kennel Club 100 years ago. The word “retriever” stays in the list with the Chesapeake Bay Retriever, desired by water fowl hunters for physical strength and a single purpose – retrieving water fowl. With a double coat, you can depend on the Chesapeake to work in, and stand up to, the toughest conditions. This breed is very loyal to its owner but may be less outgoing with strangers. Training must be handled with care and softness because the “Chessie” doesn’t do well with the more heavy-handed trainer. This retriever is also quite intelligent, but you may find it a bit more stubborn than some duck-hunting/waterfowl breeds. First-time owners may find the Chesapeake Bay Retriever more difficult to work with than other breeds. However, veterans prize this dog for its performance and physical hardiness. If you’re working from a small boat, a canoe or a double-seat kayak, the larger “Lab” or “Chessie” might be a bit more than you and your watercraft can handle. In this situation, you may want to consider the American Water Spaniel, a smaller breed that won’t have as much effect on your boat stability as the bigger dogs. Two words best describe this breed: versatile and tough. Developed in the upper Midwest region of the U.S. this is a great water fowl dog, prized for its compact size that masks an amazing toughness. 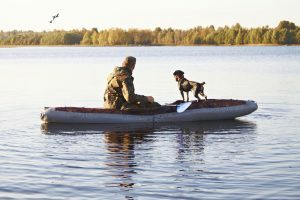 When working from a small boat, you may also want to seek out the Boykin Spaniel, of a size similar to the American Water Spaniel, their ideal for hunting from watercraft. The list of best duck/water fowl dogs wouldn’t be complete without the Golden Retriever, a breed developed by a Scottish baron from several breeds. This canine brings traits of the water spaniel, setter, bloodhound etc. to the task, giving it a great appearance and a good hunting companion and worker. 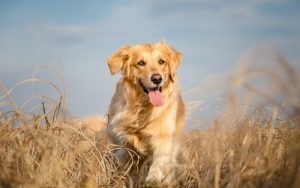 The Golden has been a popular dog breed for decades, because of its gorgeous coat that repels water and its good personality. For those who are considering the use of the Golden Retriever as a water fowl retriever, it’s important to get a young dog from a line of proven hunters. As mentioned, they are excellent family and companion dogs. However, this is a very athletic dog and works with more speed than some breeds. They do have a soft mouth, which makes them great for retrieving water fowl. The last spot on this short list should be shared by the Curly-Coated Retriever and the Standard Poodle. The “Curly” has a mix of water spaniel from several sources, giving it a coat to protect it from very cold water. An excellent gun dog, this breed is intelligent but does take some time to learn new tasks. Once it is trained in a gentle manner, it masters the job rather well. It’s a loyal companion to the owner but may be stand-offish to strangers. The poodle has gradually become a house dog or a show dog, but this breed was working with hunters several centuries ago. This sporting dog was actually developed in Germany, so adding the word “French” is a bit misleading. They’re a water dog and are known to be extremely intelligent. When trying to choose the best dog for duck hunting or water fowl hunting, you may want to take a closer look at the specific traits of each of the breeds mentioned. Some are more suitable for working from land, while others are better for working in a small boat. Size is the key factor in this decision. If you have a good working relationship with a proven trainer, you should be fine with any of the breeds, though one or two will pick up the job more quickly than others. 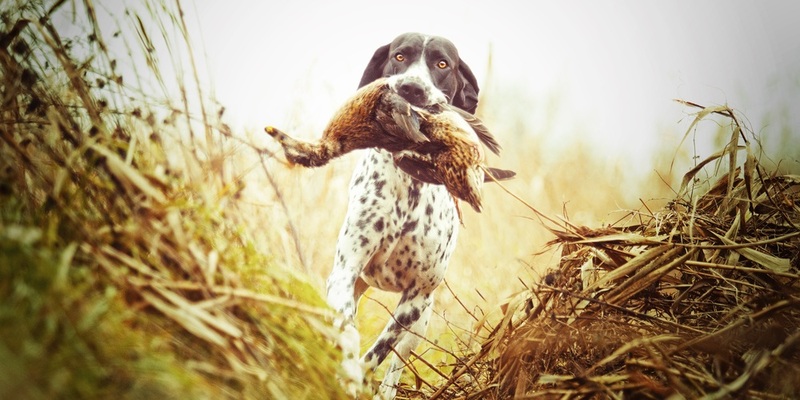 You should also consider personality when selecting the best dog for hunting. One or two breeds stand out as more friendly and outgoing in all situations. Others will be more difficult to train and may not be a good companion apart from the hunting excursion. This is why it’s also important to consider your personality. Ask yourself what you’re looking for in a dog. Is your retriever going to be a hunting tool and no more? Or do you hope to have a good friend in all situations, including with family members? 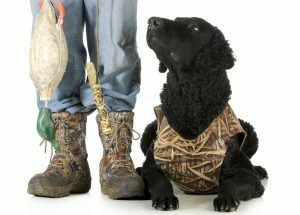 If you’re searching for more information on good hunting dogs, take a few minutes to look into the Irish Water Spaniel, and one or two other distinct retriever breeds. 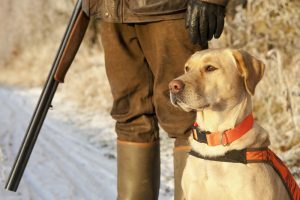 It’s essential for you to consider your experience when hunting with dogs. A beginner can rarely go wrong with a well-trained Labrador Retriever. 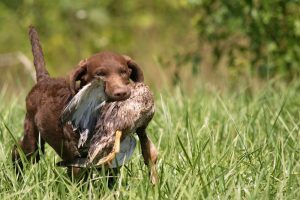 Veterans will find the Chesapeake Bay Retriever an outstanding dog in the field, though the training of this breed should probably be handled by an individual with “Chessie” experience. All the breeds mentioned are born with the traits they need to work with you in duck hunting and water fowl hunting. However, to get any dog to become an outstanding hunter you must enlist the aid of an outstanding trainer. If you are a veteran of this process, you probably already understand the slight differences in each breed. Working with a spaniel in a small boat might be the way to go, but if you’re working from a more stable spot you may want to consider the “Lab” or “Chessie.” And, though it may be difficult to change the trend of the past few decades, it might not hurt to look into the use of a Standard Poodle. Good hunting!